Comic: "Alan Moore's The Courtyard"
Plot: An FBI investigator is trying to find a connection between a series of bizarre murders, a unique rock band and a new drug. Review: If there's one person who is consistently hailed as a visionary in the world of comic books, it's Alan Moore. The man consistently puts out instant classics, and he's essentially the go-to guy for stories that other writers can't do justice. In this case, he's doing a story that's part of the Cthulhu Mythos. If you don't know about H.P. Lovecraft and the Cthulhu Mythos, (well, you're missing out, chump!) spend five minutes on Wikipedia and come back. All set? Good. The Courtyard is a limited series of only two issues, so it's not a long story, but I think it works better that way. A lot of stories that are part of the Mythos are short, self-contained, and stand well on their own; this is another one of those. 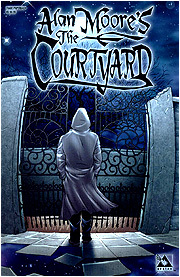 Unlike Lovecraft's work, The Courtyard is set in modern times—technically, it's set in 2004, but that's close enough. Without going into spoiler territory, the basic plot concerns an FBI agent investigating some crimes that lead him to a band called the Ulthar Cats and something called Aklo. Our boy goes to work by going to one of their shows and trying to score some Aklo, which he assumes is a drug. Unfortunately for him, he gets himself into something much, much worse. The art is fantastic, and the story wouldn't work anywhere near as well without it. Moore's writing is top-notch, as always, and he eases into the Lovecraft Universe without any trouble at all. For Lovecraft fans, a lot of the names and images will be instantly recognizable, and the whole otherworldly horror theme pervades the entire story. From the first pages, the art and narration create the sense that something's just not right, and that feeling is just as much a part of the Mythos as Cthulhu himself. Again, it's only two issues, so it's pretty cheap. Do yourself a favor and pick up a copy. Alan Moore's been working on a sequel called Neonomicon, and I think there are already a few issues of that out. Too short! I want to know just a bit more about this story. Well, you piqued my interest, so well done there! Telling you more about the story in a two-issue story is called a synopsis, not a weekly (short) review. Edit: But yeah, you should read it. The sequel is starting off well, too. I'm a sucker for Lovecraft.